A puppy’s nutritional needs are different than those of adult dogs, but as your puppy grows, how will you know when it is time for adult dog food? The answer is more complicated than just your puppy’s age, but it is possible to make a safe and healthy choice for your growing friend. Puppies require richer food higher in protein, nutrients, and calories to support their accelerated growth, energetic play, and changing physical condition. Many types of puppy food also have smaller kibbles or softer formulas to better accommodate a puppy’s size and more delicate teeth. Puppy foods are often higher in calcium, sodium, and potassium than adult dog food, as well as more heavily enriched with different enzymes that puppies need for healthy growth. As puppies grow older, however, their natural growth slows and their energy levels decrease, and they no longer need a rich, puppy formula food. 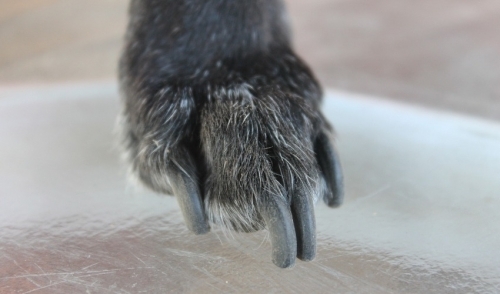 In fact, giving adult dogs a diet of puppy food can lead to obesity or other health problems, such as faster growth that can contribute to hip or elbow dysplasia or other deformations that can create difficulties for adult dogs. It is important, then, to recognize when your puppy is ready for adult dog food and change its diet accordingly. 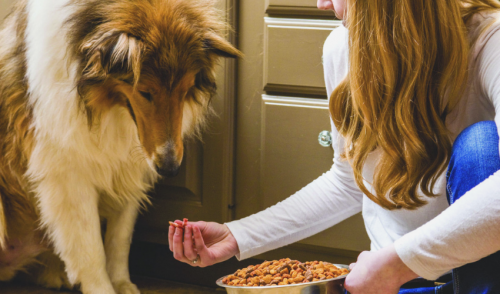 There is no one single time that is ideal for every dog to switch from puppy food to adult dog food, but there are clues you can look for to adjust your pet’s diet to meet its changing nutritional needs. As a general rule of thumb, puppies are ready to switch to adult dog food when they reach 75-85 percent of their adult size, at which time their growth rate naturally begins to slow. At what age this happens, however, will depend on the dog’s breed and anticipated size. These ages are just guidelines, however, and your dog’s activity must also be taken into account when considering the switch to adult formula food. More active and energetic breeds or dogs that get more exercise may rely on the extra energy of puppy food to meet their needs until they are closer to their adult size, while more sedentary dogs could be ready to switch to adult food sooner. Furthermore, your dog will give clues that it isn’t satisfied with puppy food when it starts eating less or rejecting puppy food, is generally less “puppy-esque” and hyper, and is sleeping a bit more. As their formerly youthful behavior changes into adult behavior, you will know your puppy is ready for adult dog food. Even when your dog is ready for a dietary change, it is important to make the transition slowly. Switching foods too quickly can lead to digestive difficulties such as diarrhea and vomiting, and if the symptoms are severe, your dog may associate illness with the food’s texture or flavor and reject it completely. By gradually switching to adult food, however, you can ease your dog onto a new diet with less difficulty. When it is time to make the switch, start by offering your dog 75 percent puppy food with 25 percent adult formula. Offer that meal for a few days, then change the ratios to 50/50. After a few more days, lower the amount of puppy food to just one-quarter of each meal, and when that is easily acceptable to your dog’s tastes, eliminate the puppy food altogether. Every dog may be different with how easily they switch diets, but ideally the transition will not take more than 7-14 days, and will cause a minimum of digestive disruption. At the same time you are changing the composition of your dog’s meals, make sure you are also switching any treats to adult formulas, and adjust how much you offer at any one meal to give your dog the right nutrition without encouraging obesity. The number of meals you feed your dog each day may change as they age, but consult with your veterinarian for more precise guidelines that will best suit your individual dog’s nutritional needs. Once you have successfully weaned your not-so-little puppy onto a diet of adult dog food, do not return to giving them puppy food, even as treats or to “use up” extra food that may still be leftover. Instead, consider donating any extra food to a shelter or humane society, where there are always more hungry puppies to feed.